The unit is 2 blocks from the beautiful Wildwood Crest beach, is on the first floor and has central air conditioning. There are two bedrooms (one with a queen bed and the other with a double bed) and one bathroom. This includes sheets, towels and blankets. Pillows are provided. The modern kitchen includes a dishwasher, garbage disposal, gas range, microwave, coffee maker, blender and all necessary cookware, dishes and utensils. The living room has a stereo, 20" color TV and a DVD player. There is a TV in each bedroom. There is also a rear deck, a gas grill and an enclosed outside shower for washing off the sand and salt after a day at the beach. The Wildwood boardwalk is a short 4 block walk away and Victorian Cape May is just a 10 minute drive. Maintain cleanliness throughout your stay. Please keep the Sand Outside!! Follow Trash & Recycling Guidelines. We were very happy with this little house and had a wonderful vacation in Wildwood Crest. The only complaint that anyone could have about this place, is that it is very small. If you are used to sleeping a King bed then the Queen in this unit's master bedroom is going to feel tiny. None of the available units that we considered had King beds either, so that one gripe is pretty weak. I just like to start with the negative. 1. Service. The owner, Elaine, was wonderful to work with. She answers all of our questions, accommodated our requests, and provided a lot of great information about the area and the rental. She responded to our messages immediately, and was very friendly and kind. 2. Location. Wildwood's boardwalk, beaches, shops, and restaurants are perfect for a family vacation, and Wildwood Crest is quiet, more residential, and has nicest beaches that I've ever seen. 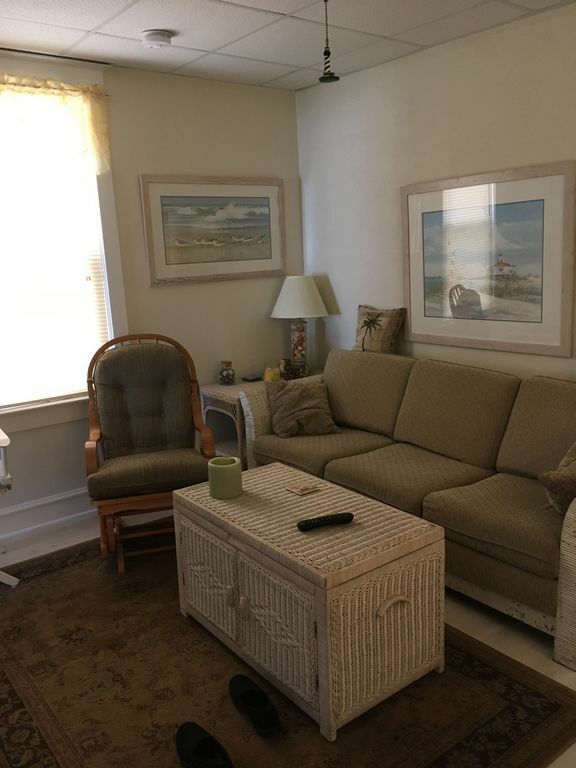 This rental house is the perfect balance between the two towns, sitting just a couple blocks from the border between the two towns, and a very short walk to the beach and to the boardwalk. There are also a lot of nice restaurants, cafes, and bakeries nearby. Even the grocery store is walking distance. We didn't touch our car all week. 3. Neighbors. All of the neighbors were quiet and friendly. We liked meeting them all and enjoyed the feel of the blocks and the neighborhood. 4. Cleanliness. The apartment was spotless. It is small but comfortable. 5. Amenities. The grill, deck, patio, beach chairs, full-kitchen, outdoor shower, and everything else that come with this unit make it a great value. It costs about the same as the nearby hotels, but you get so much more for your money. We were very happy with our vacation at this little unit. It is small but very comfortable and in the perfect location. Thank you for staying with us Steven! I’m glad you enjoyed your vacation. Please come again. Thank you! Please come back again! Wonderful place, clean, quiet and close the beach, we enjoyed our stay August 2017. I rented this unit for two weeks with my small dog and it was a perfect fit. Clean, comfortable and cozy. The surrounding neighborhood is very nice and quiet. It is only a few blocks from the boardwalk but you feel like you are in a different world when you are relaxing on the front porch enjoying the ocean breeze at night. The Wildwood Crest Beach is just down the street as is also the Crest Pier community center and outdoor basketball courts, playground and bike path. This particular block celebrates Christmas in July and strings lights across the street along with full decorations, which, as a Christmas Decoration lover, was quite a treat! The owner was easy to work with, and even came down on a Sunday in May to let me see the place before I committed to renting. All in all, I wish I could have stayed longer! Thank you John! I'm so glad you enjoyed you stay in Wildwood Crest. Please come back again! Weekends available after Labor Day. Call for rates. Lease agreement is required.